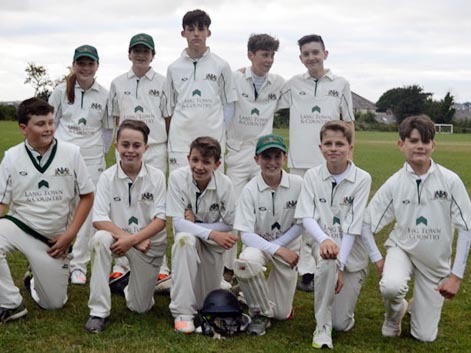 SOMETHING had to give when unbeaten Plympton St Maurice met Ivybridge at Harewood House in the under-14 division – and it was the former’s lengthy winning streak. Ivybridge slipped to eight for two before some rebuilding work was done by Zach Dunn (30), Drew Bowden (21) and Arthur Johnson (20). Billy Pitman took three for 15 as Ivybridge were bowled out for 119. Several batsman chipped in as St Maurice chased down Ivybridge's score. Jack Sellick (22), Billy Pitman (18), Oli Smith (26), Jake Agnew (29) and latterly Evie Privett (13no) all played a role in seeing the home side to victory by seven wickets with four overs left. Whitchurch came away from Cornwood with a seven-wicket win after a comfortable run chase. Unfortunately for Cornwood, who chose to bat, Ollie Carty (4-29) got amongst their top order. Jack Lane blasted 51 but with only Harry Harris (12) offering any further support, Cornwood were bowled out for 114. Toby Noy Scott (2-7) took late wickets. Nathan Prout started the run chase well before falling for 15 leaving Tyler Hunt (50no) and Fynn Hall (24no) to led the charge for victory. After Hunt retired, Toby Noy Scott scored 13 as Whitchurch got home with five overs to spare. Plympton St Mary defeated Tideford by just one run in a belter of a game. Plympton reached 150 for five in their 20 overs – Jack Sellick hitting 10 fours and a six in his 53 retired. Jack Adams (39) Josh Williams (13) and Jack Martin (13) chipped in. Sydney Bond had bowling figures of two for 19. Tideford openers James Brenton and Chris Aire put on a steady partnership with both players retiring on 50 and 53 respectively. Jake Bennett (26) continued the good work, which left Tideford needing three off the final over to win. That was when Hannah Duckworth made her mark. Her first ball went for single, then two dots followed leaving Tideford needing two from three. She took two wickets in two balls leaving two to win and a ball to go. Hannah then bowled a dot ball to finish with three for six from her three overs. Plymouth under-14s defeat neighbours Plymouth by seven runs. James Grigg (46) and Ethan Carlisle (37) were the main run-getters as Plymouth closed on 123 for four. Noah Carlisle weighed in with 16 at the top of the innings. Plymstock's top three of Bond (14), Elliott (50no) and Ed Hale (18) set off in pursuit but Plymouth's bowlers were able to restrict them to 116 for five. Plymstock soon bounced back with a 43-run win over visiting Lewdown. Alistair Bond, fresh from runs the night before, made 52 not out and with contributions from Joe Taylor (14) and Elliott Collins (13), Plymstock made 125 for seven. Tom Madge and Jonty Hughes both returned figures of 2-11 for Lewdown. Hugh Tomkinson (53) led the charge but Alistair Bond (2-6) and Sam Joce (2-5) ensured no one else could stay with Tomkinson to help Lewdown chase down the runs. Lewdown were bowled out for 82. Plymouth were also straight back into action when they entertained Yelverton and won by six wickets. Ben Bailey made 16 at the top of the order and Joe Wheeldon (28) and Will Warren (25no) scored further runs in Yelverton’s 115 for seven. Ethan Carlisle (2-4) and Molly Marsh (3-30) chipped away with the wickets. Teddy Haffenden (13) and Ethan Carlisle (52no) made a flying start before Will Warren removed Haffenden with the score on 44 after five overs. This slowed the run rate but George Jagger (12) and James Grigg (13no) pushed the scoreboard on and following a boundary and single from Grigg in the final over, Plymouth got home by six wickets with three balls left. Buckland took their revenge for a cup defeat by Tideford by winning the league rematch by four wickets. Tideford won the toss and elected to bat first. Several players got starts, Evan Spencer (19), Ajay Bond (15) and Jake Bennett (13) but the bowling of Alex Richardson (2-7) and Sam Perkins (2-0) helped restrict Tideford to 98 for nine. Buckland lost early wickets in reply, but Will Harvey (20), Billy Spry (27) and Alex Richardson (17) all fought back to see Buckland home with three balls remaining. Jack Sellick and Ollie Salt both his half-centuries to tee-up Plympton St Mary for an 83-run win at Yealmpton. Sellick’s 51 came from just 17 balls. Salt hit 52. Notable batting additions came from Alfie May (15) and Josh Williams (16no) in Plympton’s 161 for five. Best of the Yealmpton bowlers were Joe Corrigan (4-0-13-1) and David Moysop (2-0-7-1). A solid 44 from Harry Murphy batting for 19 of the 20 overs was the backbone of Yealmpton’s reply. The remainder of the batting struggled against a strong, all-round bowling performance from Plympton with Salt (2-10) and May (2-8) getting the wickets as Yealmpton finished on 78 for eight. With just over half of the season gone, Plympton St Maurice and Plymouth lead the way at the top of the table, both with seven wins from seven. Ivybridge are in hot pursuit with six wins from seven. Buckland and Plympton St Mary come next, both on 12 points from seven games with Whitchurch three points back but with a game in hand. Cornwood also have nine points from six games and Plymstock have the same but from eight games. Yealmpton come next with six points from eight games followed by Yelverton who have three points from five games. Tideford have one win and three points from their eight games with Lewdown yet to get off the mark after six rounds.